Robert joined the Clydesdale bank in Leith in September 1920 on a 3 - year apprenticeship, at salaries of £10, £20 and £40 per annum. Six years later he was appointed Accountant at the Gorgie Branch, where he stayed until September 1929. Earlier that year he had been offered a post with the Midland Bank, who had owned the Clydesdale Bank since 1919, and he was appointed to the Threadneedle Street Branch, in the City of London. Before leaving Edinburgh, Robert became engaged to Marjorie Bruce Sclater, who had qualified at Edinburgh University and Moray House Training College as a school teacher. Marjorie had started the 39th Girl Guide Company at North Merchiston Church in 1926 as its Captain, and Robert was an assistant Scoutmaster at the same church, having joined as a member when the 58th Scout Troop was formed in 1919. On his move to London, Robert joined the st Columba's Church of Scotland in Pont Street, and became assistant Scoutmaster there of the 10th Chelsea Group. Most week-ends he spent at Gilwell Park in Essex helping with the training of Scout Officers. Lord Baden Powell's title was "of Gilwell Park", and though he did not reside there, Robert saw him and his wife fairly often. After he was married Robert gave up his Gilwell Park duties, but kept on with the 10th Chelsea for a few years longer. 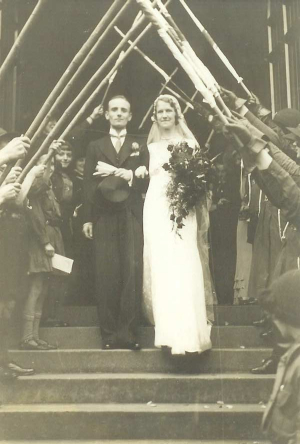 Robert was married to Marjorie Sclater on the 17th September 1932 in Edinburgh. They lived in Sanderstead, Surrey. At the start of the Second World War, Robert joined the Midland Bank Fire Brigade, and was on fire duty rota at Threadneedle Street. At Sanderstead they were close to three fighter aircraft aerodromes, and had some frightening experiences when the blitz on London was in progress. It was decided at the beginning of September 1940 that Marjorie and the children should move to Edinburgh. They went north just in time to avoid the 'big blitz' of London, which continued for 100 consecutive days. Marjorie stayed with Robert's parents at Sandon Place for a while, and then shared a house with her sister Mary, whose husband was in the Army. After a year the family returned to their home in Sanderstead, where the dining-room had been barricaded to provide an air-raid shelter and also one of the local first-aid stations. Marjorie was a qualified first-aider and was in charge of this station. Robert was not allowed to join up at first, as he was working on Exchange Control. However in October 1942 he was allowed to go, and joined the R.A.F. as a photographer on ground duties, fitting camera to aircraft and processing films when the aircraft returned. He was with the 168 Photographic Reconnaisance Squadron, which worked in close support of the Army. 168 Squadron was part of 39 Wing, the other two squadrons making up the Wing being Canadian. 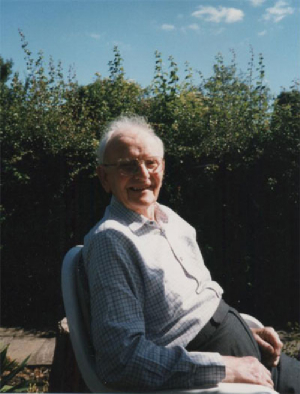 Robert took part in the Normandy Landings in early June 1944, and followed the Army closely all the way to the Baltic, finishing at a German experimental aerodrome in Travemunde. On the way he visited the Belsen Prison Camp, which had just been relieved, to take photographs, and it was a devastating experience. Robert returned to England a few weeks after the war in Europe ended, and was to be posted to the Far East, but fortunately for all concerned in that part of the Far East, the war ended. Some time after the children were settled at school Marjorie took up her Guiding again, and was Commissioner for the local area. She also took a leading role in the Women’s Institute, and became President of the Sanderstead W.I., which met in the afternoon, and a few years later started another one as President in Sanderstead, which met in the evening. Robert had returned to the Midland Bank at Threadneedle Street, steadily rising in that big branch, nd mainly dealing with loans and securities. In 1952 he was appointed Assistant Manager of the Midland Bank’s Investment Department at Head Office, and retired as Manager in 1965. Robert and Marjorie moved to Gullane, East Lothian, near Edinburgh after Robert’s retirement. Their home at Gullane was a very nice bungalow with a view looking up and down the Firth of Forth. Robert played a lot of golf as a member of Gullane Golf Club and Luffness New Golf Club. Marjorie became secretary of the Women’s Guild at the Church of Scotland, and both were elected to the Congregational Board. Early in 1977 they moved to Helmsley, Yorkshire to be nearer their daughter and in September 1982 they celebrated their 50th Wedding Anniversary. They hosted two parties, the first in Yorkshire for their close friends and family in England and the second a big family re-union in Edinburgh, at Prestonfield House Hotel. 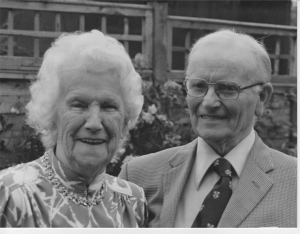 Robert and Marjorie acted as voluntary guides for one of the National Trust Properties, Nunnington Hall, and also assisted with the local Folk Museum. They were members of Helmsley Archaeology Society and Helmsley Festival Society. Robert was also a member of the local Photographic Society and the Probus Club. He also played bowls for the Helmsley Veterans Bowling Club in a local league. Extract from "History of a Macpherson Family - Margaret Hambleton 1987.